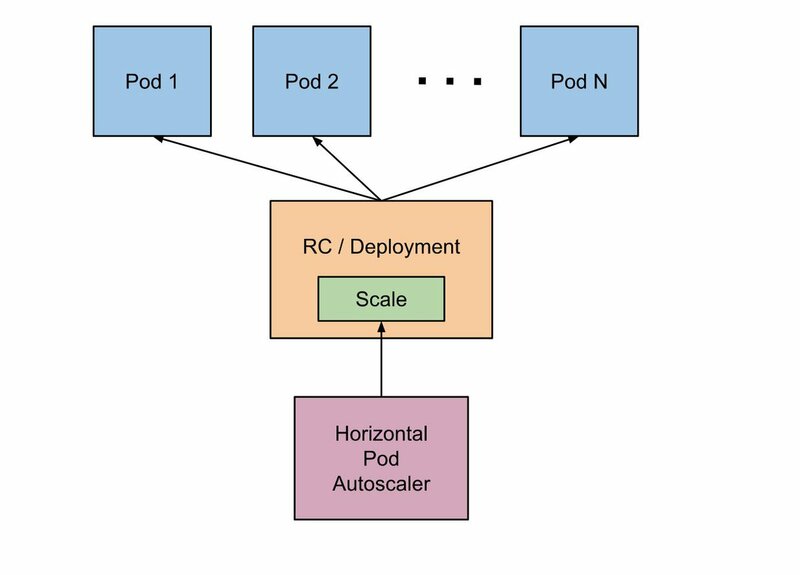 Using the Kubernetes Horizontal Pod Autoscaler feature (HPA), you can configure your cluster to automatically scale the services it’s running up or down. Note: Clusters created in Rancher v2.0.7 and higher have all the requirements needed (metrics-server and Kubernetes cluster configuration) to use Horizontal Pod Autoscaler. Why Use Horizontal Pod Autoscaler? A minimum and maximum number of pods allowed to run, as defined by the user. Observed CPU/memory use, as reported in resource metrics. Custom metrics provided by third-party metrics application like Prometheus, Datadog, etc. Releasing hardware resources that would otherwise be wasted by an excessive number of pods. Increase/decrease performance as needed to accomplish service level agreements. --horizontal-pod-autoscaler-sync-period 30s How often HPA audits resource/custom metrics in a deployment. --horizontal-pod-autoscaler-downscale-delay 5m0s Following completion of a downscale operation, how long HPA must wait before launching another downscale operations. --horizontal-pod-autoscaler-upscale-delay 3m0s Following completion of an upscale operation, how long HPA must wait before launching another upscale operation. For full documentation on HPA, refer to the Kubernetes Documentation. HPA is an API resource in the Kubernetes autoscaling API group. The current stable version is autoscaling/v1, which only includes support for CPU autoscaling. To get additional support for scaling based on memory and custom metrics, use the beta version instead: autoscaling/v2beta1. For more information about the HPA API object, see the HPA GitHub Readme. The following snippet demonstrates use of different directives in an HPA manifest. See the list below the sample to understand the purpose of each directive. apiVersion: autoscaling/v2beta1 The version of the Kubernetes autoscaling API group in use. This example manifest uses the beta version, so scaling by CPU and memory is enabled. name: hello-world Indicates that HPA is performing autoscaling for the hello-word deployment. minReplicas: 1 Indicates that the minimum number of replicas running can’t go below 1.
maxReplicas: 10 Indicates the maximum number of replicas in the deployment can’t go above 10.
targetAverageUtilization: 50 Indicates the deployment will scale pods up when the average running pod uses more than 50% of its requested CPU. targetAverageValue: 100Mi Indicates the deployment will scale pods up when the average running pod uses more that 100Mi of memory. You can also configure HPA to autoscale based on custom metrics provided by third-party software. The most common use case for autoscaling using third-party software is based on application-level metrics (i.e., HTTP requests per second). HPA uses the custom.metrics.k8s.io API to consume these metrics. This API is enabled by deploying a custom metrics adapter for the metrics collection solution. Prometheus is deployed in the cluster. Prometheus is configured correctly and collecting proper metrics from pods, nodes, namespaces, etc. Prometheus is available for deployment in the Rancher v2.0 catalog. Deploy it from Rancher catalog if it isn’t already running in your cluster. For HPA to use custom metrics from Prometheus, package k8s-prometheus-adapter is required in the kube-system namespace of your cluster. To install k8s-prometheus-adapter, we are using the Helm chart available at banzai-charts. Initialize Helm in your cluster. Install the prometheus-adapter chart, specifying the Prometheus URL and port number. Check that prometheus-adapter is running properly. Check the service pod and logs in the kube-system namespace. Check that the service pod is Running. Enter the following command. From the resulting output, look for a status of Running. Check the service logs to make sure the service is running correctly by entering the command that follows. Then review the log output to confirm the service is running. Check that the metrics API is accessible from kubectl. If you are accessing the cluster directly, enter your Server URL in the kubectl config in the following format: https://<Kubernetes_URL>:6443. If the API is accessible, you should receive output that’s similar to what follows. If you are accessing the cluster through Rancher, enter your Server URL in the kubectl config in the following format: https://<RANCHER_URL>/k8s/clusters/<CLUSTER_ID>. Add the suffix /k8s/clusters/<CLUSTER_ID> to API path. For HPA to work correctly, service deployments should have resources request definitions for containers. Follow this hello-world example to test if HPA is working correctly. Configure kubectl to connect to your Kubernetes cluster. Copy the hello-world deployment manifest below. Deploy it to your cluster. View the HPA info and description. Confirm that metric data is shown. You should receive the output that follows. Generate a load for the service to test that your pods autoscale as intended. You can use any load-testing tool (Hey, Gatling, etc. ), but we’re using Hey. Test that pod autoscaling works as intended. Use your load testing tool to to scale up to two pods based on CPU Usage. You should receive output similar to what follows. Enter the following command to confirm you’ve scaled to two pods. Use your load testing tool to upspace to 3 pods based on CPU usage with horizontal-pod-autoscaler-upscale-delay set to 3 minutes. Enter the following command to confirm three pods are running. Use your load testing to to scale down to 1 pod when all metrics are below target for horizontal-pod-autoscaler-downscale-delay (5 minutes by default). Use your load testing tool to upscale two pods based on CPU usage. Enter the following command to confirm two pods are running. Use your load testing tool to scale up to three pods when the cpu_system usage limit is up to target. Use your load testing tool to upscale to four pods based on CPU usage. horizontal-pod-autoscaler-upscale-delay is set to three minutes by default. Enter the following command to confirm four pods are running. Use your load testing tool to scale down to one pod when all metrics below target for horizontal-pod-autoscaler-downscale-delay. You should receive similar output to what follows. Enter the following command to confirm a single pods is running. Horizontal Pod Autoscaling is a great way to automate the number of pod you have deployed for maximum efficiency. You can use it to accommodate deployment scale to real service load and to meet service level agreements. By adjusting the horizontal-pod-autoscaler-downscale-delay and horizontal-pod-autoscaler-upscale-delay flag values, you can adjust the time needed before kube-controller scales your pods up or down. We’ve demonstrated how to setup an HPA based on custom metrics provided by Prometheus. We used the cpu_system metric as an example, but you can use other metrics that monitor service performance, like http_request_number, http_response_time, etc. Note: This is only applicable to clusters created in versions before Rancher v2.0.7. Before you can use HPA in your Kubernetes cluster, you must fulfill some requirements. kube-controller: Optional, just needed if distinct values than default are required. Once the Kubernetes cluster is configured and deployed, you can deploy metrics services. Note: kubectl command samples in the sections that follow were tested in a cluster running Rancher v2.0.6 and Kubernetes v1.10.1. To create HPA resources based on resource metrics such as CPU and memory use, you need to deploy the metrics-server package in the kube-system namespace of your Kubernetes cluster. This deployment allows HPA to consume the metrics.k8s.io API. Prerequisite: You must be running kubectl 1.8 or later. Connect to your Kubernetes cluster using kubectl. Check that metrics-server is running properly. Check the service pod and logs in the kube-system namespace. Then check for the status of running. Then review the log to confirm that that the metrics-server package is running. If the the API is working correctly, you should receive output similar to the output below. If you are accessing the cluster directly, enter your Server URL in the kubectl config in the following format: https://<K8s_URL>:6443. By default, HPA reads resource and custom metrics with the user system:anonymous. Assign system:anonymous to view-resource-metrics and view-custom-metrics in the ClusterRole and ClusterRoleBindings manifests. These roles are used to access metrics. Configure kubectl to connect to your cluster. Copy the ClusterRole and ClusterRoleBinding manifest for the type of metrics you’re using for your HPA. Create them in your cluster using one of the follow commands, depending on the metrics you’re using.